Home RBI Stock Market Conclusion Speech By RBI Governor Mr.Raghuram Rajan : Strong Sustainable Growth for the Indian Economy. 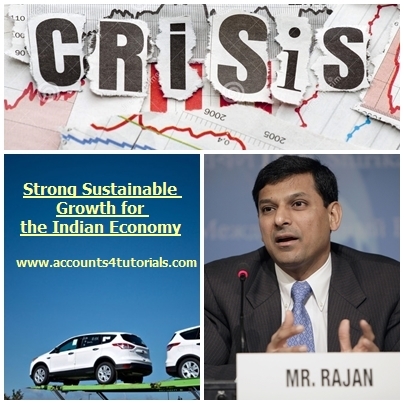 Stock Market Conclusion Speech By RBI Governor Mr.Raghuram Rajan : Strong Sustainable Growth for the Indian Economy. We live in an increasingly uncertain world. Seven years after the financial crisis, advanced economies are still growing slowly, while a number of emerging economies are experiencing difficulty as the old export-led growth model flounders. In this environment, there is both challenge and opportunity. Challenge because the world will not provide the strong and supportive growth environment we had in the last decade, opportunity because global capital is looking for investment opportunities. As I said late last year in my Bharat Ram lecture entitled “Make in India, Largely for India”, to implement the Prime Minister’s vision of producing in India at a time when trade across the world is falling, we will have to strengthen the domestic market so as to absorb much of the increased production until the global market recovers. This means we have to increase domestic demand, while avoiding the booms and busts that typically plague such efforts by emerging markets. My focus in today’s talk will be on what the RBI is doing to help the Government create the conditions for sustainable growth. Structural reforms will help strengthen this growth – two weeks ago, the Government announced Indradhanush, last week we licensed new payment banks, next month we will license new small finance banks, two new universal banks are starting in October, the providers of the TREDs system will be licensed in November, and so on, but these developments are best left to a future speech. We have come a long way since the difficulties in 2012-13 as a result of actions taken by the Government and regulators. Growth is stronger, the current account deficit has narrowed significantly, the fiscal deficit is on a consolidation path, and inflation has halved. However, three areas are still “work in progress” from RBI’s perspective. First, economic growth is still below levels that the country is capable of. Second, while consumer price inflation has moderated, inflation expectations amongst the public are still high, creating a gap between the real rates that savers expect and the rates corporations think they pay. Third, stressed assets in the financial system continue to be high, which holds back growth and new lending, even while dampening bank incentives to cut base rates. Work with the Government and banks on speeding up the resolution of distressed projects and cleaning up bank balance sheets. Let me start first with inflation: I am sure many of you are interested in what we will do next on policy. For that, I think the best summary is still our last policy statement, from which I quote, “Significant uncertainty will be resolved in the coming months, including the likely persistence of recent inflationary pressures, the full monsoon outturn, as well as possible Federal Reserve actions. As the Reserve Bank awaits greater transmission of its front-loaded past actions, it will monitor developments for emerging room for more accommodation.” Having said all I want to say on future policy, let me explain what we have been doing so far, and why we have been doing it. Despite India’s known antipathy towards inflation, we have experienced an average of more than 9 percent inflation between 2006 and 2013. The longer we had high inflation, the more the public’s expectations of inflation became entrenched at high numbers. Because the public’s inflation expectations are adaptive – meaning they change only after they see a sustained change in realized inflation – we required a long period of low inflation before expectations came down. Unfortunately, our past focus on WPI inflation, which puts weight on internationally traded goods like commodities rather than domestic non-traded goods like education and healthcare, meant that whenever international inflation came down, the clamour for rate cuts increased. So we often did not take the fight to domestic sources of inflation. Put in technical terms, the real policy rate was below the neutral real rate for years, and coincided with a pick-up in CPI inflation. The strong disinflation, even deflation, in the world in the last few years gives us a golden opportunity to change. What better time than the current for an inflation prone country like India to bring its inflation finally in line with the world’s? With commodity prices declining and astute food management by the Government, part of our work is done for us, without India having to undergo the kind of extreme demand compression that was seen in the Volcker disinflation. Indeed, with real expected policy interest rates in the 1.25-1.5% range and real after tax deposit interest rates barely positive, it would be hard to argue that the disinflationary glide path the RBI has embarked on is extremely onerous. While low inflation for a while will lower the public’s inflationary expectations and increase their real disposable income, in order to achieve a sustainable victory against inflation the public has to believe that inflation will stay low even after commodity prices start picking up in the future. For the public to look through future price spikes without raising wage demands, the RBI has to have credibility that it will act firmly against any future inflationary threats. Credibility comes from frameworks and institutions. In this regard, the RBI has signed a historic agreement with the Government, wherein RBI’s mandate is clearly spelled out in terms of an inflation objective over the medium term. In the coming year, the Finance Minister proposes to lay out, after consultation with RBI, the structure of a monetary policy committee that can be formally and legally entrusted with policy decisions. These are welcome steps in building the institutions we need for transparent and independent monetary policy. Let me address some popular misconceptions now. Modern economic theory suggests there is indeed a short run trade-off between inflation and growth. In layman’s terms, if the central bank cuts the interest rate by 100 basis points today, and banks pass it on, then demand will pick up and we could get stronger growth for a while, especially if economic players are surprised. The stock market may shoot up for a few days. But if the economy is supply constrained, we could quickly see shortages and a sharp rise in inflation. The central bank may then be forced to raise interest rates substantially to offset that temporary growth. The boom and bust will not be good for the economy, and average growth may be lower than if the cut had not taken place. This is why modern economics also says there is no long run trade-off between growth and inflation – the best way for a central bank to ensure sustainable growth is to keep demand close to supply so that inflation is moderate. Put differently, when people say “Inflation is low, you can now turn to stimulating growth”, they really do not understand that these are two sides of the same coin. The RBI always sets the policy rate as low as it can, consistent with meeting its inflation objective. Conversely, the best way the monetary authority can support growth over the medium term is to anchor inflation at low levels so that policy rates can also be low. We can never abandon inflation to focus on growth, nor do we focus on inflation to the exclusion of growth. The extended glide path over which we are bringing inflation in check appropriately balances inflation and growth. The statement “Inflation is low, you can now turn to stimulating growth” also perhaps reflects a misunderstanding of how central banking works. Monetary policy works with a lag of 3 to 4 quarters. So in deciding policy today, we need to predict how inflation will look approximately a year ahead. Today’s inflation therefore matters only in informing us about future inflation. However, today’s inflation measured on a year on year basis may be low because there was an unexpected price spurt last year – the so-called base effect. So we need to take out base effects before we even assess the information from current inflation, something many observers fail to do. Also, there may be many sources of uncertainty that cloud the future inflationary picture and disconnect it from current inflation – the strength and distribution of the monsoon, the extent and persistence of low commodity prices, the effect of external disturbances on the exchange rate, etc. In practice, we use models to project how all this might play out on inflation, and we overlay the models with the subjective assessments that our internal committee and its advisors offer, to ultimately arrive at a policy decision. Our model based assessments of the inflation path are almost surely going to differ a little from the realization, given that the world is uncertain, but they are our best professional assessments, and we set policy based on those assessments. As information comes in, monetary policy is adjusted – for instance, the substantial disinflation from November 2013 gave us confidence about the persistence of low inflation into the future, allowing us to cut the policy rate three times. What such an approach rules out is what might best be described as “inflation following policy” that some populist commentators on monetary policy advocate. Starting with the premise that all economic forecasting, especially about the future, is impossibly imprecise, inflation followers advocate cutting policy rates whenever inflation is low until inflation starts picking up. I have never heard them say what we should do then, but I presume that they would advocate raising rates at that point. But because monetary policy works with long lags, inflation could surge significantly before policy starts working. A policy that tracks current inflation, rather than anticipates inflation, is inherently biased towards more volatile inflation, which is not in the public’s interest. Another set of commentators write articles arguing that monetary policy is impotent for a variety of reasons, ranging from its irrelevance in taming food inflation to the small size of interest sensitive sectors in the economy and the lack of transmission by banks. Yet, they somehow always end the article by advocating rate cuts. Now why would rate cuts matter if monetary policy was impotent in affecting demand? Perhaps more informative is a recent study which suggests that the disinflation that has happened over the last year and a half follows from a combination of good food management by the Government, good luck because of external factors such as lower crude prices, and monetary policy, including the new framework. 3 We believe this is a fair view of the disinflation so far, entirely uninfluenced by the fact that two of the three authors are from the RBI. Let me turn to some other issues in inflation management. First, in picking the policy rate path and the pace of deflation, we have to be mindful that there are multiple players in the economy; consumers and producers who need to borrow, households that need to save, and banks that need to do both. Producers love lower interest rate, and they do not hesitate to tell us. But saving households balk as deposit rates are cut, especially if rates do not compensate adequately for inflation. The fall in household financial savings, the increase in gold purchases, and the widening of the current account deficit in recent years was partly caused by negative real after tax deposit rates. If we are not to see distortions in the economy, therefore, any policy rate path has to balance these interests – in other words, be a Goldilocks rate path which is neither too high nor too low. Of course, banks stand partially in between borrowers and lenders, and to transmit rate reductions they should be able to cut both borrowing as well as lending rates. Concerns have been expressed about Government small savings schemes that pay a high rate to households, making banks reluctant to cut their own deposit rates for fear of being dis-intermediated. While Government small savings rates should be readjusted more frequently to market rates, the growth of these schemes is small for the most part, and at least for now these schemes should not be an insuperable barrier to transmission. Second, because of a large divergence between WPI and CPI, some economists have argued there is a difference between the real rates manufacturers face and the real rates savers get. I am sympathetic to the argument, but believe the only way to tackle it is to get inflation of all kinds down – so long as the divergence between inflation in traded goods and in non-traded services is large, the problem will not go away. But I also think the concern is overblown. Even if manufacturers do not have much pricing power because of global competition, their commodity suppliers have even less. So a metal producer benefits from the fall in coal and ore prices, even though they may not get as high a realization on sales as in the past. The true measure of inflation for them is the inflation in their profits, which is likely greater than suggested by WPI. So the real interest rate they face is lower than that obtained by subtracting WPI from the nominal interest rate. Third, I have said in the past that the central bank is not a “cheerleader” for the economy. By this I did not mean that the RBI does not want to do its utmost to see the economy do well. Far from it! What I meant is that it is not the role of the central bank to elevate sentiments unduly, to deliver booster shots to the stock market so that it can soar for a while, only to collapse when reality hits. We do not have to look too far beyond our borders to see the consequences of such boosterism. Rate cuts should not be seen as goodies that the RBI gives out stingily after much public pleading. Instead, what is important is sustained low inflation, something the Prime Minister emphasized in his Independence Day speech, and rate cuts are a natural consequence that the RBI has no hesitancy in delivering. Let me turn to stressed assets. In dealing with stressed bank assets, RBI has been focused on getting the underlying real project back on track. There are a number of impediments here. The stigma as well as the provisioning (and the associated fall in profitability) attached to a loan being labelled “non-performing” makes banks eager to avoid the label. In some cases, they ignore the reality that existing loans will have to be written down significantly because of the changed circumstances since they were sanctioned (which includes extensive delays, cost overruns, and over optimistic demand projections). The Debt Recovery Tribunal system has not been speedy, which also emboldens uncooperative promoters and keeps them from accepting their share of the losses. sheets and the growing volume of “restructured” assets. Also, some large promoters take advantage of banker fears about assets turning non-performing to extract unwarranted concessions, without any sacrifice in the value of their stake. Regulatory forbearance therefore ensures that problems grow until the size of the provisioning required to deal with the problem properly becomes alarmingly large – which then prompts calls for yet more forbearance. Forbearance is also a disservice to the bank’s owners (which may include the Government) who, instead of being faced with a small problem early and being given the opportunity to apply corrective action, are faced with large problems suddenly when they cannot be pushed into the future any more. One example of the difficulties stemming from forbearance is the plight of state power distribution companies (DISCOMS). In 2012, a number of states signed up to a financial restructuring plan (FRP) with banks and the central government, based on which the RBI permitted restructured loans to DISCOMS to be treated as standard. Unfortunately, three years later, states have not undertaken many of the actions promised under the FRP, perhaps because the urgency to act was not there so long as banks continued financing losses. Meanwhile, debt has built up further, and the cost of power, including line losses and interest costs, is mounting inordinately. The central government and the RBI are taking the lessons of recent experience into account as they discuss remedial action with the states. To deal both with project paralysis as well as the unfair distribution of losses, RBI ended the forbearance accorded to restructured loans. Henceforth, restructured loans will be classified as non-performing loans. However, RBI has made it easier to recognize and deal with distressed projects. In other words, while ending forbearance, we have introduced flexibility for those who recognize and deal with stressed assets. Consider some measures. First, RBI has created a database of loans over Rs. 50 million (the CRILC database), and has required banks and NBFCs to report regularly on the status of the loans. Early identification of distressed projects offers the best opportunity to put them back on track. So if a loan is identified as more than 60 days overdue, all lenders to the borrower have to come together in a Joint Lenders’ Forum (JLF) to see how the underlying problems can be fixed. The JLF has to follow strict timelines, failing which the project loans’ classification will be downgraded. On the other hand, if the timelines are met, the deterioration in loan classification is halted. Furthermore, by bringing the banks and NBFCs into one forum, RBI has made it easier for the promoter and the creditors to reach a consensus on actions, even while making it harder for the promoter to play one creditor off against another. Second, to deal with genuine problems of poor structuring, it has allowed bankers to stretch repayment profiles for performing loans to infrastructure and the core sector (the so-called “5/25” rule), provided the project has reached commercial take-off, has a genuinely long commercial life, and the value of the NPV of loans is maintained. RBI is undertaking periodic examination of randomly selected “5/25” deals to ensure they are facilitating genuine adjustment rather than becoming a back-door means of postponing principal payments indefinitely. Also, in cases of restructuring, RBI and SEBI have together allowed banks to write in clauses that allow banks to convert loans to equity in case the project gets stressed again. Not only will such Strategic Debt Restructuring give creditors some upside in return for reducing the project’s debt, it can also give them the control needed to redeploy the asset (say with a more effective promoter). We have discussed the experience with the JLF with banks, and we will shortly announce some measures that should improve their functioning. The move by the Government to recapitalize banks is welcome, as is the proposal to reward bankers based on progress in cleaning up balance sheets and generating healthy growth. The innovative proposal to create a fund with majority private ownership and minority Government participation to lubricate the process of resolution could be very helpful. RBI and Government are also discussing ways to revitalize Asset Reconstruction Companies so that they can play a greater role in resolving distress. The Finance Minister spoke last week about accelerating the working of Debt Recovery Tribunals through the use of information technology, an idea whose time has certainly come. Given the state of the world economy, firms in some industries are in deep real distress. Some firms can survive with a little help from the Government, but others are unviable. Too much help to unviable firms can also cause distress to spread to healthy firms. In this regard, the country needs rapid progress in the coming year on the creation of the institutions necessary for resolution such as the new Bankruptcy Code and the Company Law Tribunals that will administer it as well as the Financial Resolution Authority (for resolving financial institution distress). On-going government efforts in this regard will pay rich dividends. Let me conclude. My focus on the challenges in ensuring sustainable growth should not detract from the tremendous progress we have made. There is much to be optimistic about, including the massive investments that are starting in infrastructure, the tremendous sweep of information technology across every facet of Indian life, and the radical changes that are taking place in the financial sector. The Indian economy is full of possibilities, even as much of the world is mired in pessimism. Indeed, I have been arguing that the fragility of the world economy is precisely because it has focused on quick fixes rather than deep reform. At the same time, we should not delude ourselves into thinking our work is done, or postpone hard choices to a seemingly easier tomorrow. The question for us as a society is whether we have the discipline to do what is necessary at a time when global conditions are propitious – commodity prices look like they will stay low for a time, helping the fight against inflation, and there is plenty of money around the world and at home, looking for investments, including in distressed assets, that can help us clean bank and corporate balance sheets. As India strives to regain its place in the ranks of prosperous nations, we must remember that what sets poor nations apart from the rich is not people or resources or even luck but good governance, which comes from strong frameworks and strong institutions. A summary explanation of the economic problems of the recent past is that they arose because India outgrew its institutions. A summary of the Government and the Reserve Bank’s measures to restore sustainable growth is that we are building the necessary institutions. Thank you.